Is a Credit Score Affected by Car Dealer Searches? There isn't a one-size-fits-all best way to finance a car, but there a few ways that generally work well. More importantly, there are also a few ways that'll hardly ever get you a good deal. A lot of car buyers figure out what car to buy in a way that's completely backward. If you begin by deciding which car you like best (Tesla Model S? Bugatti Chiron? ), you're probably digging yourself a hole (otherwise known as a debt load) that you'll struggle to get out of. At the end of the car buying process, you'll have a monthly payment, and that's the figure you need to begin with – and that monthly payment could buy cars over wide variety of price points, depending on which state you live in and the interest rate you're able to get on your loan. 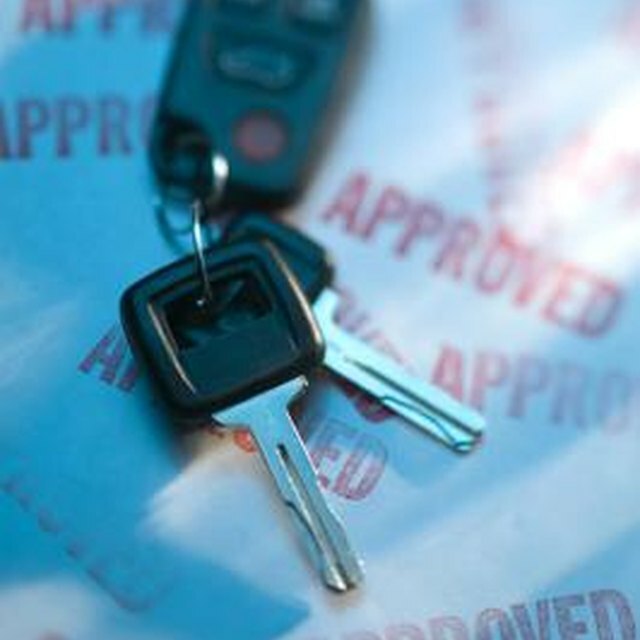 Can You Change a New Car Loan? The sales taxes you'll pay and the interest rate you can get determine how much car you can buy. For instance, if you can afford a $200 monthly car payment and you're lucky enough to live in Oregon – which has a 2018 sales tax on cars of only one percent – AND can land a loan with a one percent annual interest rate, then you can afford a car with all-in costs of $12,000. On the other hand, if your credit is fairly good but not exceptional, you might be able to get a car loan with a three percent annual rate. If you're living in Oregon, your $200 monthly car payment with a three percent loan allows you to buy a car with all-in costs of about $11,000. Now, jumping to the other, a bad extreme, suppose you have bad credit – a credit score of under 600, for instance; this means you'll probably have around a 13 percent rate on your loan. If you also live in Alabama, which has state, county and city sales taxes on car purchases that total around four percent, that same $200 monthly payment will only buy you a car selling for around $8,000. You can use an auto loan calculator to figure out what you can afford to pay for a car based on the monthly payment you can afford. You'll have to jimmy the process a bit because these calculators almost always begin with the selling price of the car, loan period, interest rate and fees, and then use that data to output the monthly payment. What you want instead is to find out (with the monthly payment you can afford and the known loan period, interest rate and fees) how much car that payment will buy. For example, assume can afford a $200 per month payment. Assume also that you want to spread the loan out as much as possible, which is normally a 60-month loan period. This is not necessarily the loan period most financial advisers recommend, but then most financial advisers have higher-than-average incomes. Also assume your interest rate is seven percent and your sales taxes are two percent. Now go to the calculator (in the references), plug in the data and select a possible selling price for the car, which could be $13,000. It doesn't really matter how accurate this figure is – it's just a convenient starting point. Now let the calculator figure out the monthly payment. In this case, that's $271, which is almost a third more than you can afford. Therefore, plug in a new selling price of $8,000, which is about a third less than your first price, and calculate again. The monthly payment using this data is $170, which is a little low, so try a selling price of $9,500 instead. The result is a monthly payment a few cents under $200. You can afford a car selling for $9,500, if you're right about the interest rate. This is just another example of why shopping for the lowest interest rate is really important. Your credit union. Credit unions are non-profit organizations by definition, so this eliminates the markup any for-profit organization must make to stay in business. Local area banks. For whatever reason, regional and local banks tend to offer better rates than the big guys (although it doesn't hurt to try one or two of them also). Make sure you bring all the following information: your social security number, driver's license and proof of income, such as a pay slip. You'll also need proof of your residence, such as a phone bill, credit card bill or your electric bill. You need to provide this information when you start shopping for an interest rate, because the rate you get depends upon your credit rating, the amount of other debt and your income. It's also a good idea to determine your credit score before you begin shopping. The lender doesn't need that information from you; the point is to let the lender know that you know your score, which conveys the unspoken message that you're an informed shopper who has a pretty good idea of the rate you deserve. It's important to realize that with loan rates, and auto loans in particular, you're rarely going to get the lowest rate the first time you ask. When you meet with your loan specialist, remember that her goal is to get you to sign the loan papers in this first meeting. Your goal is to avoid signing the papers, and getting the loan specialist's commitment, preferably in writing, for the loan at the interest rate offered. Armed with that rate commitment, you're ready to go to your second loan source. If the rate they offer is worse or no better than the rate commitment you already have, tell them. Often you'll then be offered a better rate. At that point, they might offer it with the warning that they can only make this offer if you're ready to buy immediately. Don't believe that for a minute. This is all a haggling process. Make up any excuse you want to put pressure on them to give you the rate commitment without you committing to the loan. Maybe you have to talk to your husband or wife about it. Or your parents. Whatever. The point is to gather rate commitments, hopefully each one better than the previous commitment. At some point – probably after you've gotten rate commitments from at least three institutions – you're ready to go to the auto dealer where you can both shop the car and get another rate commitment. This is where you have to use all the willpower and cunning you can muster because most larger dealerships have someone whose job is closing loans. They're better at this than you are because they do it every day. You'll be pressured to sign the loan, which has the interest rate offered "only if you sign now." Your job is to explain why you can't sign immediately. Maybe you have a skeptical husband, wife or parent who needs to see the paperwork before you they'll agree the loan. Again, whatever excuse is fine. The point is to get them to commit to you without your committing to them. Despite auto dealers' pressure tactics, the less-than-completely-honest sales pitches and so on, you still should ask the auto dealer to take a shot at getting you the best loan. A dealer is effectively a middle-man between you and the actual lender (dealers rarely finance auto loans themselves). This is both good and bad. It's good because a dealer's loan volume often enables him to get lower rates from lenders than you can as a lending customer. What's bad is that dealers, as middle men, can legally mark-up your loan to make an additional profit and, unless you're careful, charge you extra fees. A last thought on loan rate shopping: Don't be shy about doubling back to the first lenders if you now have a lower quote. Often, when shown proof of a lower rate (which means you'll surely walk if they can't do better), they'll come up with a rate to beat it. You always want to know the loan rate, but in order to be sure of what you're getting you, you also need to know the monthly payment. That's the bottom line. If you don't nail down both numbers, you may end up with a low nominal _interest rate for a loan that has a lot of fees that make the real interest rate considerably hig_her. Most of these fees are fictional in the sense that there's no concrete need for charging the fee, other than to make money. One fee that many dealers will try to add onto the loan in the closing is the Dealer Preparation Fee, which is a scam-like charge for doing what every dealer (or any seller of anything at all) has to do, which is getting what they're selling, in this case the car, ready for sale. When you get both the offered interest rate and the monthly payment offered with it, you're nailing down the APR interest rate, which is the Actual Percentage Rate – by law, the APR rate must includes all charges, including dealer fees. RealCarTips: Which Dealer Fees Are Legitimate?